This program was put together to have one centralized, nationwide location to assist in the first step of valuating properties. 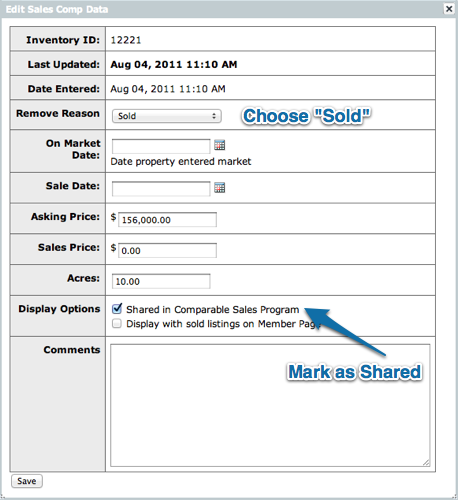 Each Lands of America member has the ability to share information about properties they are involved with selling. As a result of sharing this information, they are enabled to search the entire program for comparable sales. This information is only a starting place and should be treated as such. The sales information is to be used in a general way and always verified by a professional to ensure the integrity of the information. It’s also easy to add a new Comparable Sale. Disclaimer: The property information in the Comparable Sales Program is from the Source listed and is believed to be reliable. While Lands of America does not doubt the accuracy of the information, we have not verified it and make no guarantee, warranty or representation about the information, whether express, implied or otherwise. The responsibility lies with the user of this information to confirm the data’s accuracy by contacting the Source or through some other method. The details of this transaction may depend on a variety of factors which should be evaluated by professionals to ensure accuracy without any doubt. If this information is to be used for any purpose, then an independent professional should be contacted to investigate and ensure the accuracy of the data being used. The information on this page is proprietary information and cannot be published in any other location without the express written consent of Lands of America.